We have noticed that many of us are not able to update our Lenovo A6000 device using the OTA Update. Many of our blog visitors have complained that it is due not having the Lenovo A6000 Lollipop Stock Recovery but having the custom recovery installed, which was found to be right and also for a rooted device, the most common error while installing the OTA update for Lenovo A6000 is the Status 101 and then followed by Status 7. For Status 7 we do have a fix and most of us know about it, but the Status 101 error which pops up while updating our devices was mostly unknown, but there is a fix for it too. We need to install the Lollipop stock recovery for installing the OTA update without any error. You just need to follow the guide which we’ve tried to make it as simple as possible so that you don’t get confused. You can do it in two ways and that is using a pc/laptop or without it using the Flashify app on your Lenovo A6000 which is running on Lollipop. But we would prefer using the pc/laptop if it is available with you because it is more convenient and sometimes without PC/laptop it is not successful to install recovery without it on your device. DISCLAIMER: In no means, we are responsible if you brick your phone or your SD card dies or your phone behaves abnormally. It is your sole and your own responsibility to root your phone. Step 2: Copy the lollipoprecovery.img file to C: Program Files (x86)Minimal ADB and Fastboot or C: Program FilesMinimal ADB and Fastboot directory. 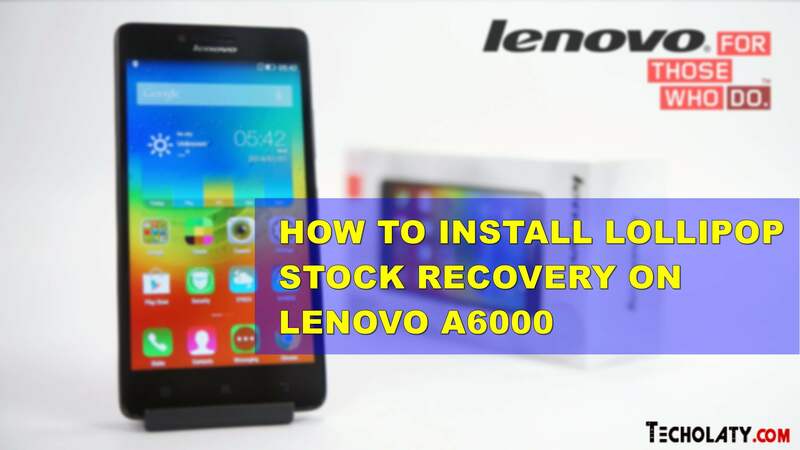 Now you have successfully installed Lenovo A6000 Lollipop Stock Recovery. Now you can install the OTA update without any Status error 101 or Status error 7 on your Lenovo A6000. Good day. After I updated the system update from the settings of my Lenovo A6000-l I had an error of android no command with these options “reboot now, clear/wipe cache, factory reset, update from sd card or adb/ I tried to click reboot now, clear cache and reset but it will only reboot and back to no command. Can you please help me what to do. Thank you. please give me stock kitkat recovery img!!! Does the above process roots mobile? The drivers have not been installed properly. Please install the drivers for your device first.